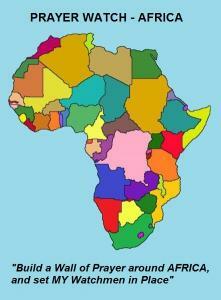 WHAT IS “THE AFRICA WALL OF UNIFIED AND CONTINUOUS PRAYER (The AFRICA Wall)”? 1. It is a WALL OF CONTINUOUS (24/7) PRAYER built around the Continent of AFRICA. 2. It consists of no less than 168, KINGDOM MINDED and GOD FEARING LEADERS from every NATION of AFRICA referred to as WATCHMEN on THE WALL – especially those who are standing as GOD’S GATEKEEPERS over their NATIONS, STATES (PROVINCES), REGIONS and CITIES. “THE AFRICA WALL OF PRAYER” also consists of Groups of PRAYER, such as Weekly Church Prayer Meetings and All Night Prayer Gatherings – also referred to as Corporate Prayer. These are from many of the NATIONS of AFRICA. 3. It is a UNIFIED WALL OF CONTINUOUS PRAYER in that every week a PURPOSE DIRECTED Prayer Guide will be circulated to guide the UNITY of PRAYER on THE WALL. 4. It is a CONTINUOUS WALL OF PRAYER – no less than 168 KINGDOM MINDED and GOD FEARING LEADERS from every NATION of AFRICA, WATCHMEN on THE WALL, have committed to ONE SCHEDULED HOUR of PURPOSE DIRECTED Prayer, as per the circulated Prayer Guide, EVERY WEEK for the Next SIX MONTHS. Thus every HOUR of every DAY (24/7) of every WEEK there will be at least ONE WATCHMAN standing WATCH on “THE AFRICA WALL OF PRAYER”. 5. It is a CONTINUOUS WALL OF PRAYER – we are keeping a register of the Prayer commitments of the KINGDOM MINDED and GOD FEARING LEADERS; as well as the CORPORATE PRAYER GATHERINGS from every NATION of AFRICA. Every week we will be sending a reminder of their Prayer commitment accompanied with the weekly PURPOSE DIRECTED Prayer Guide. The "AFRICA Wall" was established at 00:00 AM on Sunday, 30 June 2013.